20 – In today’s NBA, the draft is two rounds with each team having two picks resulting in 60 new NBA players. In 1973, however, the draft lasted a flabbergasting 20 rounds as 211 players were selected to the NBA. The draft was so many rounds that future MLB Hall of Famer Dave Winfield was selected in the 5th round by the Atlanta Hawks. In fact, Winfield was drafted by four professional sports leagues that year: the NFL, the NBA, the ABA and the MLB. What a guy. So close, and yet so far. The refs decided to let the players decide the fate of the game as the Sixers shot only 3 free throw attempts in the second half, and Toronto pulled away in the 4th quarter to screw over our cover. I don’t have any regrets – that game was going to be won by the team that went on the last run, and it just happened to be Toronto. I’m over it. Elsewhere in the NBA, Russ and PG-13 combined for one of the most R-rated box scores I’ve ever seen out of a duo, Chef Curry cooked up another 40-point game, and the Wizards subtweeted John Wall’s ball-dominant ways with a 35-assist victory over the lowly Hawks. Have fun paying John Wall $46 million in three years, Washington. GET THURSDAY’S WINNING BASKETBALL BET FREE ON A RECORDED MESSAGE! CALL 1-800-546-7217 NOW! With the TNT slate at our disposal, I had my choice of a) the Celtics vs. the Knicks, or b) Houston vs. Utah. Since I’m not a big fan of masochism, I refuse to subject myself to another Knicks preview – Emmanuel Mudiay and Noah Vonleh can promptly go to hell. Instead, let’s take a peek into the wonderful world of James Harden as he takes on Donovan Mitchell. The Jazz sit as a 2-point favorite in their home arena with the total set to 217 points. Let’s break this thing down. Before we get to our featured NBA pick, be sure to read tonight’s NCAA Basketball play courtesy of Dan Jamison. Iowa State takes on Iowa in this backyard basketball battle. 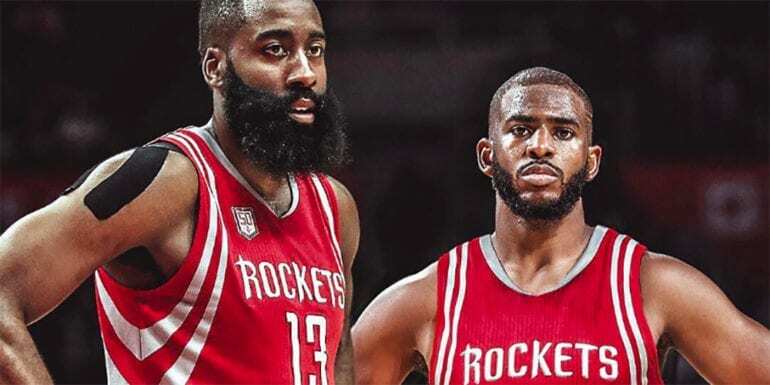 Now that Chris Paul is back in the mix, the Houston Rockets are on the precipice of a tone-setting run back to the top of the Western Conference. With a healthy Capela, Harden and Paul, the Rockets were an astonishing 50-5 last season; this year, only 10-5. In a world where a three-game winning streak can move you from 9th to 3rd in the conference, now is the time for Houston to make their move. That, however, may be easier said than done. Houston’s next four games are all versus teams above 0.500, and they need to kick things off with a win in Utah tonight. In their first meeting, Chris Paul was supplanted by former Rookie of the Year Michael Carter-Williams in the starting lineup, and that went about as well as you would have expected. With Harden shifting back into MVP-mode and Clint Capela earning every dollar of his contract, the Rockets have sidled up to 7th in Offensive Rating while playing at the league’s second-slowest pace. Against the Jazz, however, they could use a bit of tempo to make the DPOY Gobert uncomfortable and force him to play more in transition. But all things run through Harden and his match-up vs. Donovan Mitchell. Round 1 went to the Don – I highly doubt history will repeat itself. Throughout the first quarter of the season, not many teams have been more disappointing than the Utah Jazz. After last season’s incredible second-half run, a lot of NBA “experts” (myself included) imagined them as a top-4 team in the Western Conference. Between Donovan Mitchell’s disregard for other humans, Rudy Gobert’s stifling rim-protection, and Joe Ingles and Ricky Rubio doing their weird foreign things, Utah was set up to be a legitimate threat to the Western Conference crown. Now, all of the “Weaknesses” from Mike Schmitz’ pre-draft breakdown video for Mitchell have come to light, and Utah’s offense has tumbled because of it. No passing and too many shots make Donovan a dull boy. But against Houston, Donovan’s reckless hero-ball is the exact reason why they can prevail. In a world of pace-and-space and ball movement, Houston slammed on the brakes and decided that an isolation-heavy offense revolving around two of the world’s best shot-creators was the way to differentiate while still dominating. But a slowed-down game is exactly what Utah asks for, and ol’ Donny Boy knows how to get his shots off too. As long as Utah’s complimentary pieces can provide the platform for Mitchell to do his thing while making it difficult for Houston on defense, Utah will stand a chance to knock off their Western Conference nemesis. Don’t be surprised to see this devolve into a glorified one-on-one-on-one battle between Donovan, Harden and Paul (hint: under, under, under). Since we’re all about finding the edge here at Predictem.com, let’s take the time each day to dive into the stats that lead to winning basketball games. According to a theory posited by Dean Oliver, a win in basketball can be narrowed down to four factors: shooting, turnovers, rebounding and free throws. Each day, I will take a look at the areas that each team excels at or is susceptible to, and we will see if we can find a specific reason why Team A will beat Team B.
It’s no surprise to find Houston near the top of the NBA in efficient shot-making; they have two of the five best shot-making players in the world, and a rim-running lob threat to boot. However, I wasn’t prepared to find Utah and Houston virtually tied in terms of opponent’s shot-making – both in the bottom-third of the NBA. Rough start for two of the four Western Conference finalists on defense. Rebounding-wise, it’s hard to tell who has the edge. In their first meeting, Utah rebounded 26.5% of their own misses while out-boarding the Rockets by 12. Gobert has been on a tear in his last couple of games, and he’s posted a double-double with multiple blocks in 4 of his last 6 games against Clint Capela. Ultimately, each team’s advantages on the glass should even out, but nevertheless, it’s a battle to keep your eye on to determine the winner of this one. Finally, we can see that Utah is elite at two skills – getting to the free-throw line, and taking care of the basketball. With a genius-level point guard like Rubio and a balls-out driver like Mitchell, neither of those surprise me. Against Houston, the latter will come in handy, as Houston ranks dead-last in the NBA at defending without fouling. In their home arena, this Utah team should live at the line and shove Houston’s own offensive game plan right back down their throat. We’re approaching the point of the season where the preconceived notions that we carried over from last season have begun to fade away as we see just exactly who these teams are. The problem is that these two aren’t exactly teams that we have figured out yet… and either have the sportsbooks. It seems like Utah is a zig-zag team; they’re bad when you think they’ll be good, and they’re good when you expect them to be bad. Eventually, their defense should click. The league is getting to that time where they begin to soften on their “points of emphasis” from the off-season rule changes, and as Utah is allowed to play more physically without getting whistled, their opponent’s field-goal percentage will start to plummet and their record will be begin to rise. But Houston is a different beast, and Harden in particular has been unstoppable. His offensive genius has provided more flash than substance this year, but Chris Paul’s return should help Houston shed some of their early-season rust that has bogged them down. More importantly, I’m a Donovan Mitchell-hater and a James Harden-apologist, and Harden’s is 4-1 in his career versus Mitchell with averages of 33 points, 6 rebounds and 7 assists. Get your popcorn out for this game. On the bright lights of TNT, I’m expecting Harden and the Rockets to finally blast off.